As Winston Churchill said, never, never, never, never, give up! 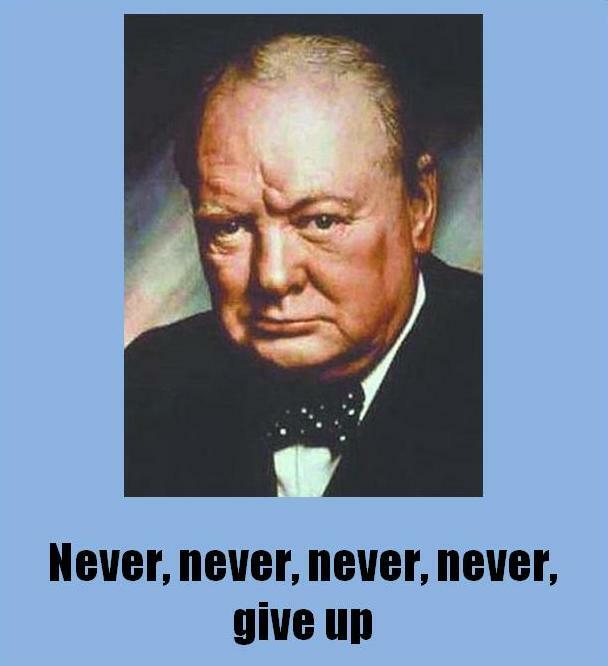 Great strong and encouraging words; you can imagine them being powerfully delivered by Winston Churchill, but as time goes by, those events of that time lose their high profile. Eventually over time to the average person, the most relevant point in that speech becomes; never, never, never, never, give up! Because that line speaks its message so clearly to an individual. As for your dreams you must; never, never, never, never, give up! As for your goals you must; never, never, never, never, give up! As for your plans you must; never, never, never, never, give up! As for taking action you must; never, never, never, never, give up! As for your desire and faith in your goals you must; never, never, never, never, give up! Take a dream in your imagination and make it into a goal, write that goal down, have desire and faith in that goal, and then take constant action towards that goal. In order to reach that goal you must; never, never, never, never, give up!